When I lived in Kentucky during the 1990s, I went to work along U.S. 60 in an area called St. Matthews. High upon a particular phone pole, at the intersection of Lexington Ave. and Shelbyville Road, hung an Lincoln Heritage Trail (LHT) sign. Another such sign hung a few miles east on U.S. 60, at the intersection of Grinstead Drive and Interstate 60, and I recall signs on the road toward Frankfort, where historical markers commemorated the death of Lincoln’s paternal grandfather in that area. But I always liked that St. Matthews sign the best. It was faded, placed too high to be noticed easily, and was too far from other LHT signs that might have guided a traveler. It seemed a relic of an earlier time. One day, as I returned from work, I noticed it was gone. 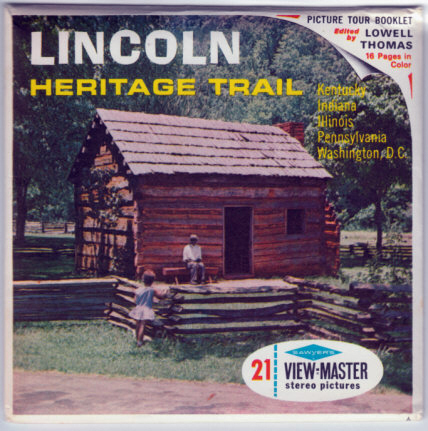 The trail, a series of highways in Illinois, Indiana, and Kentucky, tied together towns, parks, and locations associated with Lincoln. In Illinois the trail follows highways like U.S. 51, Illinois 121, Illinois 29 and 97, U.S. 25, U.S. 34, U.S. 150, Illinois 1, 14, 15, 185, and old U.S. 66, linking towns associated with Lincoln like Vandalia, Salem, Mt. Vernon, Carmi, Marshall, Charleston, Decatur, Lincoln, Springfield, Petersburg, and others. A southern “alternate” trail connects towns like McLeansboro, Carbondale, Chester, Cairo, Vienna, Harrisburg, Shawneetown, and others. Here is a good photo at the village of Ware, IL, through which I’ve passed, in southwesternly Union County: http://shields.aaroads.com/show.php?image=IL19490031 A northern alternate branch connects Beardstown, Mt. Sterling, Quincy, Nauvoo, Monmouth, Galesburg, Peoria, Metamora, Bloomington, and others. Anyone taking a trip over a few days can visit New Salem, Lincoln sites in Springfield and Coles County, the Vandalia Statehouse, and other Illinois places—to say nothing of Indiana and Kentucky places, like his birthplace near Hodgenville, KY and his boyhood homes in Knob Creek, Kentucky and Spencer Co., IN. Lincoln visited lots of other places, too. Because it primarily follows the earlier travels of Lincoln, the LHT omits Alton and some other Lincoln-Douglas Debate locations. I used to teach a course called “The Life and Times of Lincoln” at University of Akron. One of the books I refer to is Following in Lincoln’s Footsteps: A Complete Annotated Reference to Hundreds of Historical Sites Visited by Abraham Lincoln by Ralph Gary (New York: Carroll & Graf Publishers, 2001). If anyone wants a very comprehensive guide to places Lincoln visited, you couldn’t go wrong with this nice text. Lincoln set foot in twenty-three states during his life, all but four (Iowa, Missouri, Arkansas, and Louisiana) east of the Mississippi. East of the river, he visited all the states except Maine, Alabama, Florida, and the two Carolinas. Besides the DC area and places like Gettysburg, his notable historic sites are in the three LHT states. Another good book about his life travels is Don Davenport, In Lincoln’s Footsteps: A Historical Guide to the Lincoln Sites in Illinois, Indiana, and Kentucky. I have the first, 1991 edition but newer editions have been published. I’ve driven some of the LHT, not nearly all of it. When I lived in southern Illinois several years ago I followed the southern alternate trail a few times, enjoying favorite communities. When our daughter was younger, we visited New Salem during an enjoyable weekend trip. A few summers earlier we visited the birth site in Kentucky—the enormous temple enclosing a pitiful shack provides a startling contrast. The boyhood cabin site in southern Indiana, with Nancy Hanks Lincoln’s grave nearby, is also an enjoyable visit. Traveling Lincoln’s life metaphorically is something else again. So many biographies and monographs consider his life. What was the relationship between him and his parents? Was his marriage as positive as it could be, given the Lincolns’ different temperaments, was it or a living hell? Lincoln was compassionate, tenderhearted, cruel, highly intelligent, crude, horribly depressed and lightheartedly humorous—who couldn’t be fascinated by such a complex, contradictory person, let alone someone who guided the country through its darkest times? Among the several biographies that I own, I’ve enjoyed Michael Burlingame’s two-volume Abraham Lincoln: A Life since it came out a few years ago. I wonder who travels the LHT today, consciously I mean, in order to seek out places pertinent to our greatest president. It’s the kind of leisurely, semi-educational vacation people would take when they weren’t in a big hurry. Nearly everyone, however, is in a big hurry. I can imagine a car-full of whiney children, posed stiffly against a series of historical markers, their pictures preserved in a scrapbook later. Perhaps I’m being too nostalgic, though, for many of the signs are still there (though not “my” sign in St. Matthews), if not enough of them to give confidence to someone traveling without a map. The signs still beckon us to seek after Lincoln’s heritage off the fast-paced interstates. If you decide to go, take your time, and have a good time learning! In addition to the LHT, there is the famous and much longer Lincoln Highway. Both were conceived in the 1910s to honor the 50th anniversary of Lincoln’s death. While the LHT was not designated until the early 1960s, the Lincoln Highway was laid out as a drivable coast-to-coast road, from Times Square to San Francisco. Interestingly, the Lincoln Highway is the oldest memorial to the president: the Lincoln Memorial itself opened a few years later. It was also the first transcontinental highway. As with other named roads established during the 1910s, the Lincoln Highway was replaced in 1926-1927 with a series of numbered routes. For most of its length, the Lincoln became U.S. 30. In the West, however, U.S. 50 is nearly identical with the road through Nevada and California, since the pathway of 30 veers away from the Lincoln in western Wyoming and proceeds northwesterly through Idaho and Oregon During the 1940s and 1950s, many U.S. routes were realigned to bypass the business districts of small towns, but many communities, like Massillon and Canton, retain the Lincoln designation for the main streets. 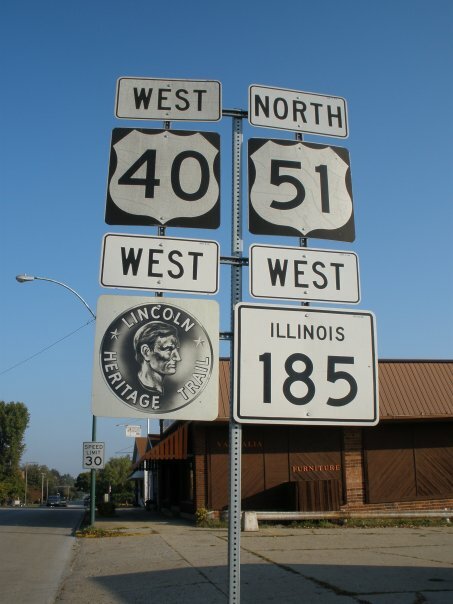 In Illinois, the old route of the Lincoln/U.S. 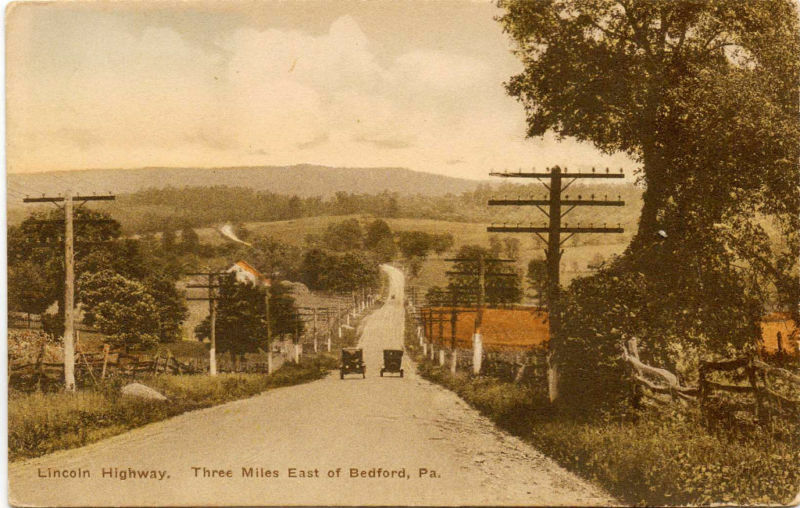 30 is state route 38, after the highway was routed to the south. In 1928, an effort was made to keep alive the route and memory of the Lincoln Highway: a series of concrete posts laid along the entire road. Each featured a plaque indicating that the road was dedicated to Lincoln, along with the president’s famous profile. Sadly, there are far fewer of these posts remaining than there are LHT signs. When we lived in Ohio, I was glad to see a post in East Canton, OH in its original location, although some towns have erected replicas of the posts. As you drive two-lane highways, you can occasionally spot earlier alignments, left over when the route was straightened or moved. Around my hometown, I liked to see old alignments of U.S. 40, like the several yards of roadbed just east of the river bridge, the dead end road left when 40 was rerouted slightly to accommodate Interstate 70, and a wide curve at the western edge of town en route to Hagerstown, IL. Another abandoned curve is north of Vandalia, just to the east of the modern U.S. 51, with an old concrete bridge that still has the metal plaque, common on such bridges, which dates the road to the 1910s. I could list several other examples of locations that I like. I’ve noticed the same thing as I’ve driven the old Lincoln Highway. When we lived in Ohio, one day I drove down State Route 21 down to Massillon and then proceeded east on Lincoln Way, which is the old Lincoln Highway as well as the original U.S. 30 (now routed south of the town). Driving through Massillon and Canton, I rejoined highway 30 and drove out into the country for a while. I enjoyed seeing the oldest paths of the Lincoln Highway as they moved away from the modern highway, made a long curve, and then reconnected. 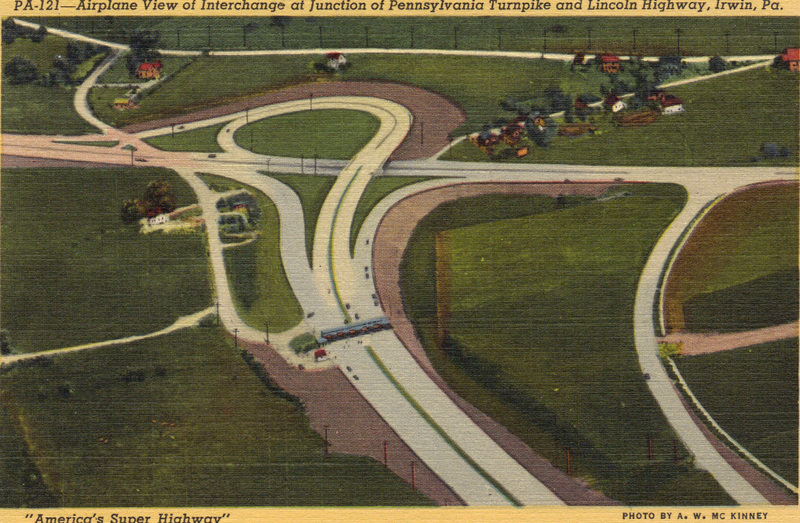 Whenever I drive U.S. 30 through western Pennsylvania, I spot the same thing: old highway alignments left over when the highway was straightened in the 1940s or thereabouts. 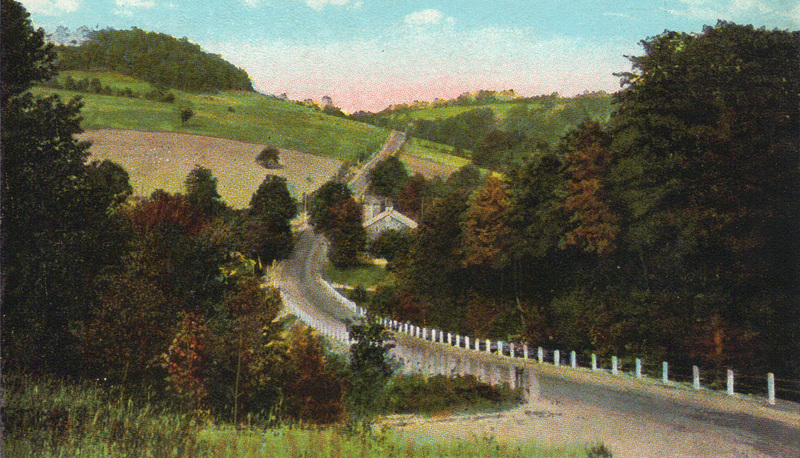 Just west of Greensburg, for instance, an alignment curves around to the south and up a hill, then descends the hill and becomes the main street through the town. A mural on a downtown building calls attention to the days when the Lincoln Highway was this street. Many interesting places can be found along the highway, as Hokanson’s and other books show. One was the S.S. Grand View Hotel, a ship-shaped establishment built on the side of a Pennsylvania mountain (http://www.brianbutko.com/lh.ship.html). Kearney, NE, where one of my college friends lives, is the middle-point on the highway between New York and San Francisco; in 2013 the highway’s centennial will be celebrated there. My grandfather Crawford was the oldest of eight children: three boys and then five girls. Most of the family lived around my hometown but one great-aunt and her husband moved to Laramie, WY. They were named Ruby and Pearl, but since I always knew about them and visited them sometimes, I never stopped to think how funny they were both named for jewels and that Pearl is a different kind of name for a man. They, and their three sons and several grandchildren, were great, hospitable people. 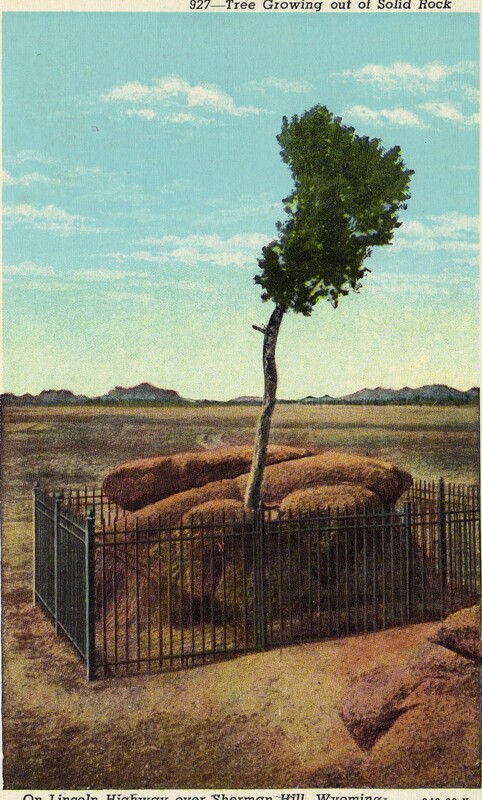 During one of our visits to Laramie, when I was about seven, we stopped and saw a famous Lincoln Highway scene, the tree growing from a boulder. I thought that was something fantastic! That was a long set-up for a small, personal Lincoln Highway memory. But how many millions of small memories–of family visits, vacations, business trips, and so on—define the Lincoln Highway, over its entire coast-to-coast route! But the highway is defined in a different way: not only travelers, but people who lived, worked, and shopped in local business districts through which the road passed. I grew up in Vandalia, Illinois, the former state capital. Lincoln began his political career there as a 25-year-old legislator attending the Ninth General Assembly in 1834-1835. He served two more legislative terms at Vandalia and a final term once the state government moved to Springfield. Of course, as a Vandalian, I heard about Lincoln from a very early age. Eventually I learned that several family members lived there while Lincoln was a legislator at the old capital, and one ancestor even helped construct the statehouse where Lincoln served. Lincoln and Stephen A. Douglas met for the first time in Vandalia in 1834 and subsequently served together during the 1836-37 General Assembly. The “Little Giant” distinguished himself at Vandalia as a powerful speaker and a master of partisan practice. Lincoln began more modestly – according to Usher Linder’s reminiscences, one legislator saw him and another homely colleague and asked “Who the hell are those two ugly men?” But Lincoln grew in sureness and abilities during his terms in the house of representatives. 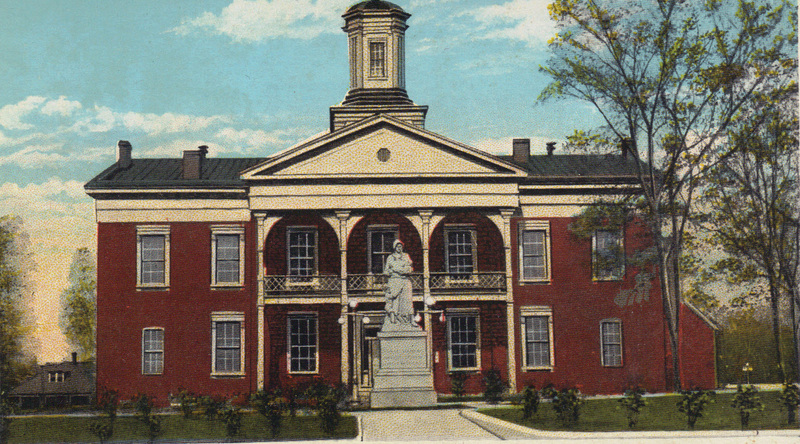 Lincoln’s probable places of lodging in Vandalia no longer exist, so the statehouse is the town’s foremost Lincoln site. A “Madonna of the Trail” statue stands at the corner of the public square, near the statehouse. 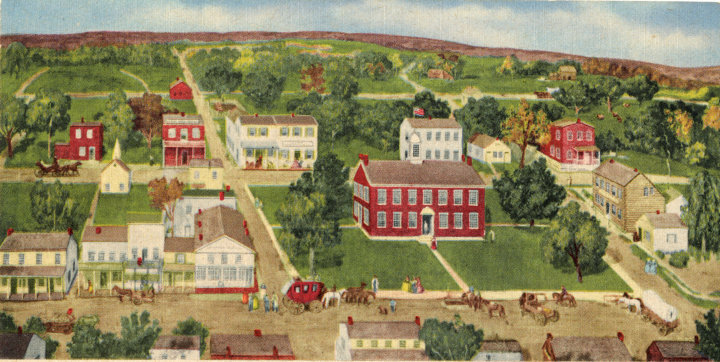 (Originally it stood in front, as this old postcard shows.) In the same year as those Lincoln Highway posts, 1928, twelve of these statues were placed along the route of another early, transcontinental highway, the National Old Trails Road. That was had been incorporated into U.S. highways 40, 50, 350, and 66. While the statues do not honor Lincoln per se, Vandalia’s honors pioneer women, the memory of Lincoln, and the terminus of the pioneer National Road. Vandalia’s Madonna inspired great fanfare. Harry S. Truman, then a Missouri judge, was scheduled to speak but canceled at the last moment. The celebration and pageant parade went on apace, and my father and his sister are among the young “Indians” in the panoramic photograph of the celebration. Once, in a shady neighborhood of a small town, I discovered a historical marker that called attention to an 1850s Lincoln speech. In Vandalia, no plaque is needed; the old capitol reminds us each day that the greatest president began his political career here. (Lincoln’s visits to Vandalia in 1856, which would have earned an historic marker in any other town, have been largely forgotten locally.) The young man Lincoln walked the same streets as the shoppers and business people and the teenagers who traipse around looking for something to do on a dull, hot summer day. If he came to town today, he would come downtown from Springfield on LHT routes like I-55 and IL 185. Perhaps he’d make a joke about all the signs he passed that featured his own distinctive profile.